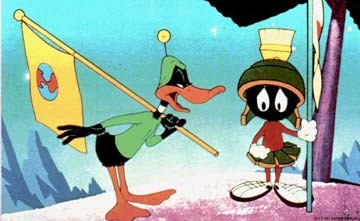 On Carolyn Gargaro's Marvin the Martian website, you can see this image. It shows another "world flag" that is somehow forgotten. The one used by Duck Dodgers in the 24 1/2 Century (Warner Bros' Looney Tunes). On Carolyn Gargaro's Marvin the Martian website, you can see this image. 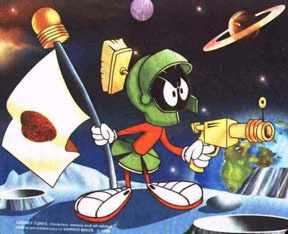 It shows the flag of the planet Mars used by Marvin the martian. This flag can be seen in the 1953 theatrical short Duck Dodgers In The 24th-And-a-Half Century! Marvin the Martian plants this flag to stake a competing claim for planet X in the name of Mars. Meant to be symmetrical with Dodgers's 'Earth' flag, I guess, hence the near-identical designs. Though while Earth is just a brown-blue smudge, Mars features a fair bit of surface detail, and the background is a much paler yellow.